"It always amazes me how many of our notable Scots were so good at languages. I'm not sure where they got this talent from." "In proportion to their numbers they (Scots) are the most distinguished little people since the days of the ancient Athenians, and the most educated of the modern races." Indeed a writer of the history of Glasgow in 1817 states, "The attention that has been paid to the education of the lower orders of the Scottish nation has been proverbial over Europe for several centuries past." It can be argued, as James Scotland does in his 1969 book, 'The History of Scottish Education', that education is first and foremost the training of people to be literate, and that this involves their studious reading of numerous learned documents in many different languages that have been handed down the ages in writing; for Scots this means, from the time of St Columba's landing on Iona in 563. Mr Scotland also claims that the main influences on the promotion of literacy as education were 'pietism', 'poverty', and 'relations with England and Europe', and that Scots have 'always remained firmly, and even superstitiously devoted to the concept of education.' Scotland was the first country in Europe to take political action when it passed an education act in 1496. Not only were schools placed in every parish by government, but also the churches, many charitable societies, and private individuals provided financial resources to faciliate their building and operation. "Not only was there a willingness to provide places; there was an eagerness to take them up. The 'lad o' pairts' whose parents made grinding sacrifices to give him his chance, and who would trudge miles daily through all weathers to attend school or university has always been a focus of popular sentiment and pride." One has only to glance at synopses of the biographies of celebrated authors and poets from early times up to the early twentieth century, to note how the vast majority of them received early school training in literacy, even if some did not always express great admiration for its efficiency and immediate effectiveness. 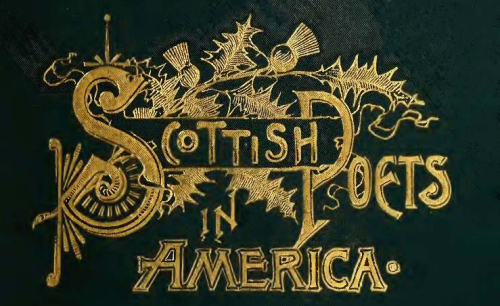 The book, 'Scottish Poets In America', provides examples of the foregoing claim.